When Abraham Lincoln was nine years old, his mother died from an ailment called the "milk sickness." Only later did he learn that his mother's deadly affliction was actually the work of a local vampire, seeking to collect on Abe's father's unfortunate debts. When the truth became known to the young Abraham Lincoln, he wrote in his journal: henceforth my life shall be one of rigorous study and devotion. I shall become learned in all things—a master of mind and body. And this mastery shall have but one purpose." While Abraham Lincoln is widely lauded for reuniting the North with the South and abolishing slavery from our country, no one has ever understood his valiant fight for what it really was. That is, until Seth Grahame-Smith stumbled uponThe Journal of Abraham Lincoln, and became the first living person to lay eyes on it in more than 140 years. Using the journal as his guide and writing in the grand biographical style of Doris Kearns Goodwin and David McCullough, Seth has reconstructed the true life story of our greatest president for the first time—all while revealing the hidden history behind the Civil War, and uncovering the massive role vampires played in the birth, growth, and near-death of our nation. Man, was I wrong! I was reminded of that old adage “Don’t judge a book by its cover”. This was a great book! I devoured it in a little over 2 days. Take what you know about Abraham Lincoln in terms of his humble upbringing, his education, and his political career and add a generous helping of genuinely frightening vampires woven into the very fabric of his being and who he became as a man, and you have some idea of how enthralling this book really is. 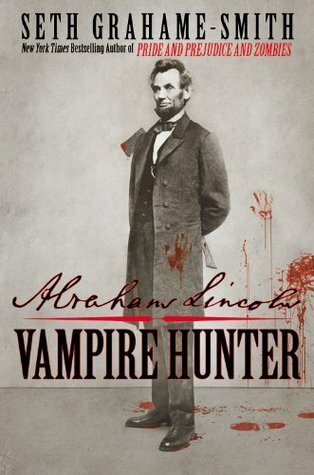 I loved reading about President Lincoln, and it was really cool to float with the author through his vision of what Abraham Lincoln’s life would have been like had he spent most of it hunting and killing vampires! Grahame-Smith (the author) makes this book so believable and enjoyable that I found myself almost wishing every word of it had been true – except when he freaked me out by weaving the tale of how vampires fought on the side of the Confederacy during the Civil War (for their own very disturbing reasons) and how they actually caused the Holocaust and World War II! Don’t even get me started on the ending of this book. Awesome. Seth Grahame-Smith’s writing style makes it effortless to read his books. I am planning on reading some of his other works for this very reason – probably Pride and Prejudice and Zombies and, if it is was originally a book (which I believe it was), Dark Shadows. Grahame-Smith does such a good job with his characters that he makes you feel like you are friends with them and have been for years. Do you know the real story behind what happened to all of those settlers in Roanoke, Virginia? How about the main reason Abraham Lincoln abolished slavery? How would you like to find out? Rating: 5 Stars - Perfection! Paul literally devoured the book. We've added the movie to our Netflix Queque and will post a review to compare the movie to the book. Glad you've decided to give it a try!